Passengers could face further delays this evening at Three Bridges, as a signal fault has led to two platforms being closed at the station. 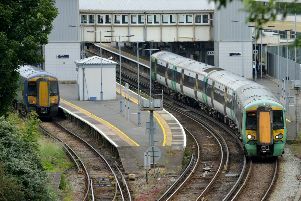 Southern Rail said disruption is expected until 5pm today (July 5), and that services running through the station could be cancelled or delayed. Most London to Sussex routes run through Three Bridges, so the incident could cause further misery for those caught up in delays this morning. The incident at Three Bridges comes as a signalling shutdown at Streatham this morning meant many Sussex services could not run to London Victoria. Although Network Rail said it has found a temporary fix, that issue is set to cause delays until 7am tomorrow morning (July 6). A Southern spokesperson said: “Platforms 2 and 3 at Three Bridges are currently out of use at Three Bridges station. Services are expected to experience further delays whilst awaiting alternative platforms to become available. “Network Rail engineers are on site and are investigating the fault and will work to repair it as soon as possible. The incident is set to impact on Southern Rail and Thameslink services.